Each social follow link can be set to any url. 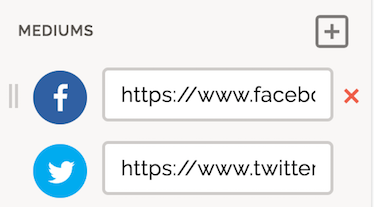 Although you can set a social link to any url, we recommend only setting urls from the social platform you are linking. Currently, we support 20 Social Follow Links: Dribbble, Email, Facebook, GitHub, Google+, Instagram, LinkedIn, Medium, Pinterest, Reddit, RSS, Soundcloud, Spotify, Tumblr, Twitter, Vimeo, Vine, and YouTube. Like all components in Landing Lion, you can add social follow links to any page variant or page template by dragging it from the Right Pane and dropping it on the Canvas. There is no limit to the number of social follow links you can add. To select social follow links in Landing Lion the Selection Tool must be set to "Auto" or "Element". Social Websites - add, set, reorder, and remove your social media profile links here. Each new social follow links component starts with two mediums: Facebook and Twitter. Set the url of each medium to your company's pages or pages you want to drive traffic to. In your page, mediums are ordered left to right or top to bottom. Use the handle on the left (two vertical lines) to reorder your mediums. Add a medium by clicking the grey "+". To remove an existing medium, click the red "x" to the right of it. Style - by default, social media icons are white and are embedded in a colored circle. Choose the option on the right if you do not want your mediums' icons to stand on their own. Size - choose one of the three sizes for your medium icons: small, medium, or large. 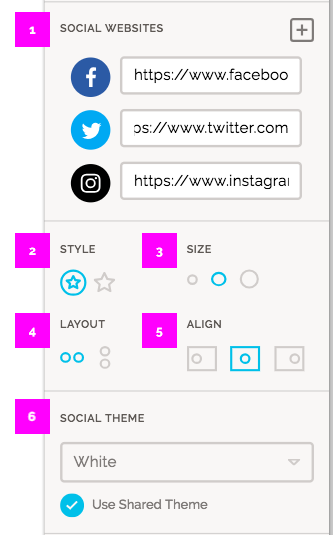 Layout - choose to have your social follow links stack vertically (top-to-bottom) or horizontally (left-to-right). Align - choose from one of three alignments: left, center (default), or right. Social Theme - newly added social follow links use the default colors for their brand (established in your pages color palette). Alternatively, you can make them black or white. A newly added social link shares its theme with other already added social follow links components. Uncheck "Use Shared Theme" to make a social follow link's theme unique.